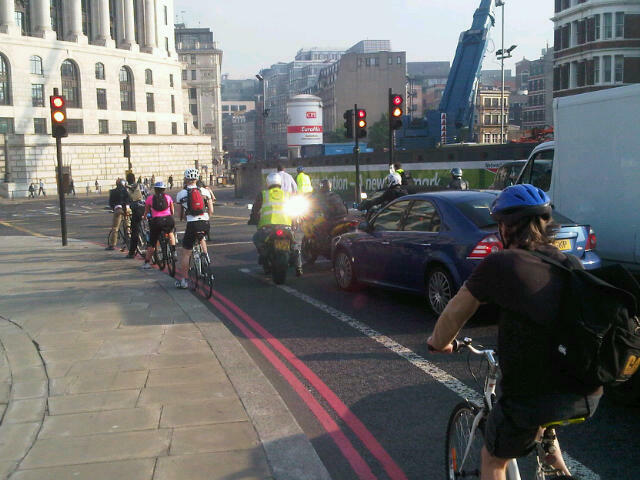 Cyclists in the City: Blackfriars road safety auditors recommend: "Ensure [cycle] lane widths are appropriate". TfL does not accept the recommendation but Boris implies change may happen. Blackfriars road safety auditors recommend: "Ensure [cycle] lane widths are appropriate". TfL does not accept the recommendation but Boris implies change may happen. Following several Freedom of Information requests, Transport for London has finally released its road safety audit relating to the junction design at the northern end of Blackfriars Bridge. You can download the initial road safety audit here and TfL's responses to the audit here. Ensure [cycle] lane widths are appropriate to safely accommodate the expected usage. There are too many cables under the pavement, apparently, and therefore TfL can't accept a recommendation by its road safety team to make the cycle lanes an acceptable width. What this shows is that TfL knows that it should have more space allocated to cycling here. But tellingly, TfL thinks that space for cycling can only be created by narrowing footpaths (which in this case is not an option). There's no effort whatsoever to reduce the amount of space given to motor traffic, just an obsession with making people on foot or cycles fight among themselves for what little space is left after TfL has added more space for motor vehicles. I don't know why this comes as such a surprise. A couple of months ago, I blogged about the man in charge of London's roads thinks that people on cycles don't need safe space to cycle in. My understanding is that he thinks it's absolutely fine for motor vehicles to scrape past you at 30, 40 or maybe even 50mph and give you just a couple of centimetres of space when you're on a cycle. - as the London Cycling Campaign highlights here on its site: "Alignment through the [Blackfriars] junction may result in increased cycle collisions. The proposed build-out between the off and on slips for Victoria Embankment effectively pushes northbound cyclists 0.5m closer to the nearside running lane and may result in increased conflicts ..."
- completely fails to consider the impact of increased numbers of people cycling (the data used seems to be that from 2007) and though it talks about the risk of drivers cutting in to the narrow cycle lanes, it doesn't consider that the lanes are so narrow at some points that cycles have no choice but to spill out from the cycle lane, particularly of the segregated bit just north of Watergate. The number of cyclists is a big issue because the volume of cyclists doubled between 2007 and 2010 and will no doubt be higher still in 2011. Incidentally, that coincides roughly with the period that a 20mph limit has been in force. - removal of New Bridge St pedestrian crossing: TfL rejects the safety recommendation saying its not an issue due to its clever software modelling then later on says that the software has only 'been used to forecast the most frequently used desire lines for the station', i.e. seems to have missed out this crossing. The London Assembly will meet again on July 20 to vote for the motion to retain 20mph at Blackfriars. You can sign a petition in support of 20mph on the London Cycling Campaign website. Last time they met to vote on this motion, the Conservatives walked out of the chamber, nullifying the process. Then, last week, Boris Johnson made a very clear statement rejecting 20mph but stating 'more works needs to be done on cycling over Blackfriars Bridge'. Let's see what happens this week. This is lovely. TfL pretty much ignored every single safety request there apart from a keep left sign. What was the point in having a safety review then? Certainly it explains why they wanted to keep this hidden -it's hard to justify a design with this document criticising it. "As would be the case at all such locations, safety audit procedures have been carried out at appropriate times during the life of the design process. Once the changes made as a result of the stakeholder engagement process held earlier this year were incorporated, a full safety audit was completed on the final design. This procedure identified no major safety concerns within the design proposal. Some minor concerns were raised and the design was revised in order to resolve these." Where is the 'value for money' in paying for a safety review TfL have no intention of implementing?